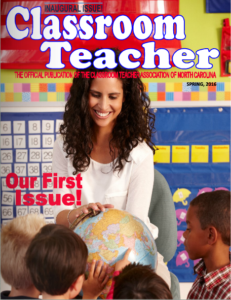 The official Publication of the Classroom Teachers Association of North Carolina. 2) once opened, you’ll use the arrows on the left and right side to turn the pages. 3) You’ll also be able to click on any link within the magazine, just like you would if clicking to a website, and you can also click on the advertisements to see what they have to offer. 4) Also, you can click on your mouse to “zoom in or out” on pages as you deem necessary. This magazine is supported by advertising and they would love to hear from you! For more information about our Magazine click Here.